So stated Ken Hughes, a leading consumer and shopper behaviouralist, in his keynote presentation at Trasnsplace’s 16th Annual Shipper Symposium a couple of weeks ago. The comment caught my attention because later that morning I was going to moderate a discussion with Dan Dershem, General Partner at Supply Chain Ventures, about emerging technologies such as blockchain, artificial intelligence and machine learning, autonomous trucks, and digital freight. As I listened to Mr. Hughes’ presentation, it struck me that he was right: all of these technologies, in many ways, are a response to the demands we consumers are placing on supply chains. It’s the reason why P&G, Home Depot, and Target are all redesigning their supply chain and fulfillment networks. It’s the reason why On Time In Full (OTIF) is a critical supply chain metric today. It’s the reason why a growing number of companies are starting to view logistics as a competitive weapon instead of just a cost center. 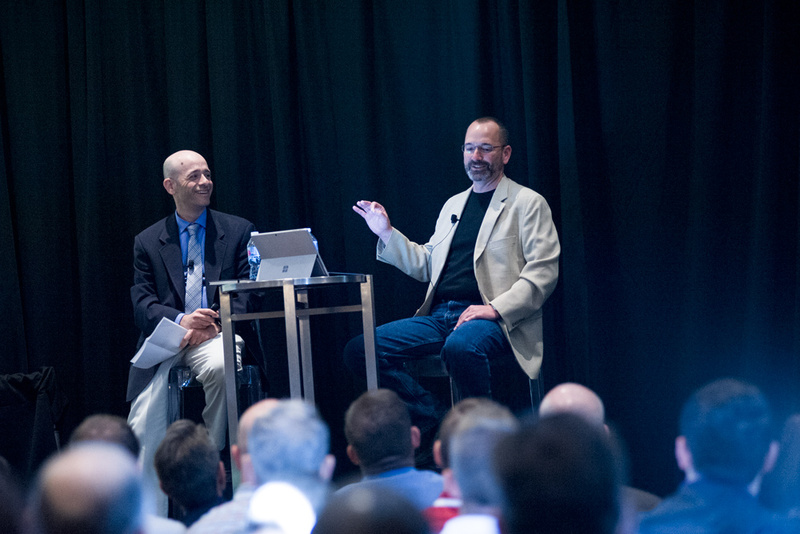 It’s the reason why more than 300 people attended this year’s Shipper Symposium: to learn about the trends shaping the industry and to discuss how to rewrite the rules for success moving forward. There were a lot of great sessions and speakers during the conference, but I don’t have the time or space to summarize them all today. Here are some of the highlights, beginning with the session I participated in. When it comes to emerging technologies, supply chain and logistics executives are caught in a bind: they don’t want to dive in too early because some of these technologies may ultimately fizzle out or they’re afraid to bet on the wrong technology or vendor (think Betamax vs. VHS), yet they also recognize that if they wait too long, they might get left behind by the competition and won’t be able to catch up. The goal of this session, where Dan Dershem and I engaged in a “fireside chat” conversation with each other and the audience, was to break through some of the hype and noise out in the market today around blockchain, AI and machine learning, autonomous trucks, and digital freight and provide a more pragmatic view of the where we are today with these technologies and what we can expect moving forward. Not surprising, blockchain generated the most interest and questions from the audience. I began by sharing some of the points I wrote about recently in Blockchain Will Solve, Save, Cure Everything. In short, although blockchain is being positioned as a miracle cure for just about everything you can imagine, there are still many challenges associated with it, including lack of standards and relatively poor scalability. Estonia is a great example of what can happen with a concept like blockchain if you’re able to start with a clean sheet of paper. As a citizen of Estonia, virtually every transaction you would need to perform that involves a government agency can be performed on their systems utilizing the concept of blockchain or distributed ledgers. The only transaction that cannot be performed without a person being involved is the transfer of land. Estonia was able to accomplish this because they had no legacy technology to deal with. In fact, the government estimates that it saves about 2.5% of GDP in costs to perform government functions versus non-digital countries. Dan highlighted some of the areas where blockchain has the most potential to deliver value at the moment, including global trade and finance, food supply chains (for recalls and traceability), high-value goods (e.g., pharmaceuticals, electronics), and to prevent counterfeiting. The majority of the people in the room raised their hands. As I wrote about recently, disrupting logistics ain’t easy. The logistics industry, especially trucking, remains highly fragmented and inefficient, which is why so many entrepreneurs and investors believe it’s ripe for disruption — they’re like sailors lured by the Sirens’ song, straight to a shipwreck. My point of view: success in this industry, whether you’re a technology-based startup or an incumbent, depends on three things: building critical mass; remembering that transportation is not a commodity and that relationships matter (and taking this reality into consideration in your operating model); and measuring and controlling the quality of the end-customer delivery experience. AI and machine learning can be leveraged using existing solutions and processes — that is, there’s no need to “rip and replace” the investments you already have in place, which is why Dan is so bullish about this technology. Dynamically reroute a local delivery truck based upon traffic, weather, driver behavior, or a consignee’s receiving characteristics. Optimize dock schedules in real-time based on the real ETA of a truck, or even more exciting, based on the demand for the products in the truck. Predict what e-commerce items are going to be returned as the order is being placed. Connect AI to a software-as-a-service TMS to allow for a completely lights out planning and execution process. 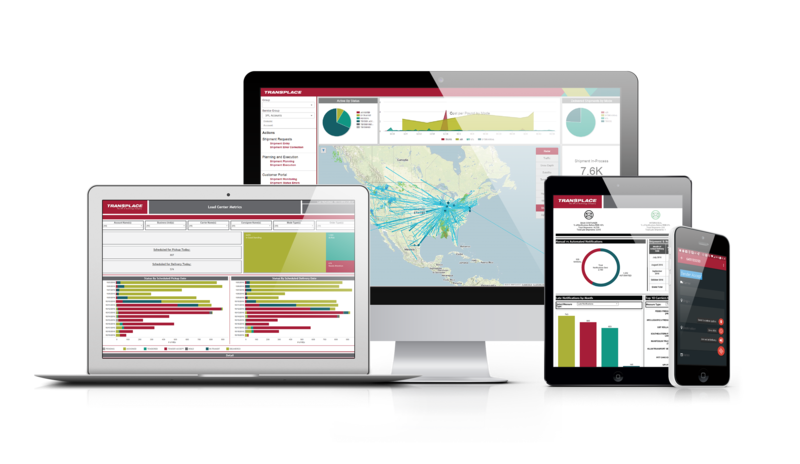 Like many other leading logistics service providers, Transplace invests significantly in technology, including its own software-as-a-service transportation management system (TMS). One of the newest enhancements is a Control Tower solution, which was developed with input from its customer Nestle Waters. During one of the breakout sessions, Ken Rogers, National Transportation Director at Nestle Waters, along with Mike Dieter (CTO at Transplace), Robert Hatty (GM,Operations, Transportation Management at Transplace), and Chu-Chi Ng (Technical Manager, IT at Transplace) provided a demo of the Control Tower solution. As the saying goes, a picture (and demo) is worth a thousand words, so I’ll just say that the solution provides users with a very user-friendly, configurable, and graphical view of their transportation operations — with emphasis on managing exceptions based on data feeds from real-time freight visibility solutions such as FourKites, MacroPoint, and 10-4 Systems (as well as traditional check calls from carriers). Nestle is an early adopter of the solution, but “six months from now, I want my transportation planners to say, ‘I can’t imagine how we got our work done without Control Tower’,” said Rogers. In short, Control Tower will ultimately become the main user interface for the TMS, with new capabilities on the roadmap, including adding visibility to international shipments, integration with RiskPulse, and AI capabilities. I’ve had the opportunity to work with Transplace for several years and the company today is very different than it was not too long ago. For starters, through several acquisitions, the company is much larger today than just a few years ago, in terms of revenues (more than $1.8 billion in gross revenues from more than 1,000 customers), employees (2,000+), scope of services, industries served, and locations (25 offices across the United States, Canada, and Mexico). The company has a new owner in TPG Capital, which acquired Transplace in August 2017 (the firm has also invested in supply chain tech companies LLamasoft and Transporeon), and a new CEO, Frank McGuigan, who had been the company’s president and COO. Based on past history and current ownership, I expect more acquisitions from Transplace this year and beyond, not only to augment the services it provides to existing customers in Chemical, Food & Beverage, and Manufacturing, but also to expand into new vertical industries, such as Retail and Electronics, where Transplace has a smaller presence today. I also expect Transplace to expand its technology footprint and software-as-a-service offerings moving forward, whether it’s via partnerships with other TPG-owned companies, internal development efforts, or maybe an acquisition or two. 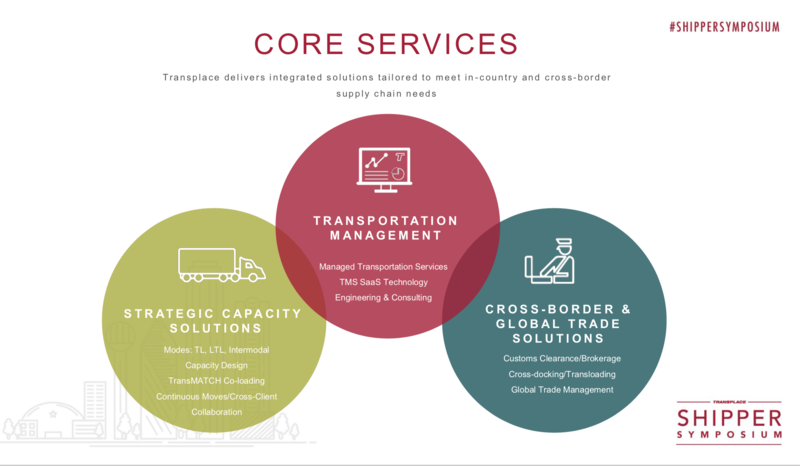 Over the years, I have often pointed to Transplace as an example of how the worlds of technology, consulting, and managed services are converging. This convergence will continue, not only for Transplace but the industry as a whole, because that is what manufacturers and retailers want: partners that can provide them with the right mix of technology, services, and advice to help them achieve their desired outcomes.